They say you can tell you’re getting old when the police start looking younger. But perhaps it is still best to stick with cops as your measure. If you use business school students, you might end up thinking it’s high time for retirement. At b-school campuses around the world the average age is dropping. And it’s the increasingly popular Master in Management (MiM) program and other specialized master’s in business that are responsible. According to the 2013 GMAC Applications Trends Survey on interest in business education, while just over half of all test takers in Europe still go on to apply for an MBA, application volume for European MiM programmes has increased 73% for the 2013-14 class. The fact that these alternative business programmes tend to ask for less – in some instances, no – work experience means that they are attracting younger potential students than traditional MBAs. 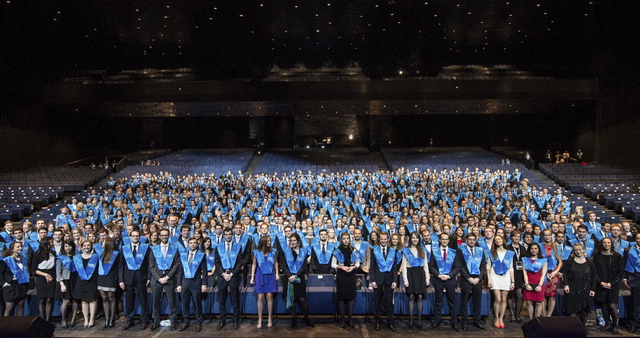 More than half of all GMAT test takers in Europe are now aged under 25. Money may, of course, play at least some part in this. Many of the new batch of MiM programs, for example, cost no more than a third of the price of a top flight MBA. And the shaky job market of recent years has made the prospect of staying in full-time education for as long as possible an attractive, perhaps for some the only, option for graduates of first degrees. Several top US schools – Northwestern Kellogg, Michigan Ross, Babson College – are getting in on the act, and Dartmouth’s Tuck School of Business was earlier this year considering to launch an MiM for undergrads with little or no work experience, though this project is currently on hold. But the US is playing catch up in a market dominated by European business schools. Among the market leaders is the CEMS Alliance, arguably the most ambitious partnership in business education. Established in December 1988 by four leading European schools (ESADE, HEC Paris, Università Bocconi and the University of Cologne) the CEMS Alliance designed the first truly European business education through one single Master’s in International Management degree. At a time when the modern European Union did not yet exist, the Berlin Wall still stood, and the majority of business was conducted at a local, not international level, the pioneer program allowed students to travel between member schools and countries for their studies, equipping them with the necessary skills to succeed in the international markets of the future. It’s a formula that is clearly working. Since its launch 25 years ago, CEMS now embraces 29 institutions from nearly as many countries, and this year’s MiM includes 1,053 students from 67 countries, making it bigger than the MBA programs at the likes of Harvard Business School and INSEAD. Over 60 Corporate Partners that include McKinsey, P&G, L’Oréal and Google are beating down the doors to recruit younger managerial talent. In this interview, CEMS Executive Director Roland Siegers looks at the trends that are driving the popularity of the MiM, both with bachelor’s graduates who are keen to differentiate themselves, and with recruiters who want to hire young managers with greater maturity and a global mindset. He also talks about the challenge of bringing together 29 universities to deliver one degree and one curriculum in international management. He likens CEMS to a bumble bee: “the laws of aviation tell you this thing should not fly, but it actually does, so something must be wrong about the assumption.” The MIM has consistently ranked in the top 10 of the Financial Times for the past 8 years, so something must be working.